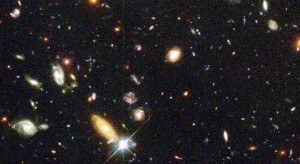 1. Who is famous for classifying different types of galaxy? 2. Describe the 5 main types of galaxy. Has bright bar running through nucleus through which spiral arms appear. 3. What is a Tuning fork diagram? 4. Draw a Tuning fork diagram. 5. 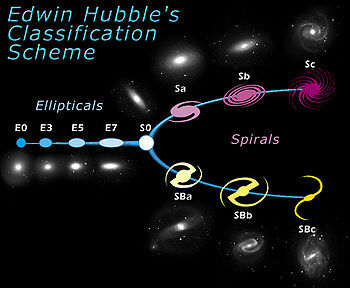 Give the classification of our own galaxy’s structure. 6. What is the Local Group? Galaxies are groped together just like stars . This is the local groupOur Local Group has 5 neighbouring galaxies. 7. 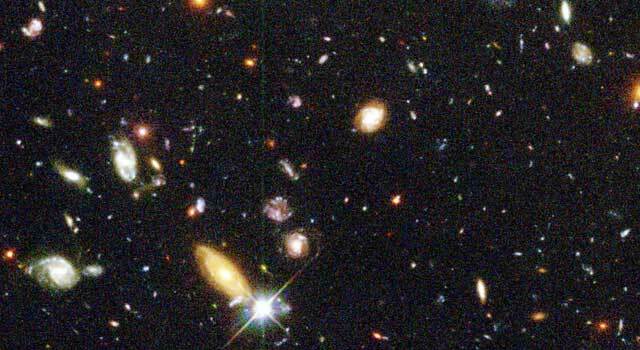 Name 6 galaxies in our Local Group. 8. What is a cluster? Many local groups of galaxies can be found in gravitational agglomerations called clusters. Often there is a giant elliptical galaxy at the centre of a cluster. 9. What is a super cluster? A group of clusters held together by gravity. Our local group and cluster belong to the Virgo Supercluster. 10. What is an Active Gallactic Nucleus? Region in the centre of some galaxies emitting huge amounts of radiation. Radio, infra red,UV, X-rays, Gamma rays. Supermassive black hole at centre. One of the oldest objects in universe. Emit strongly in all regions of the spectrum. Optical brightness can vary over 1 or 2 days.